Purchase this product now and earn 3,567 Reward Points! 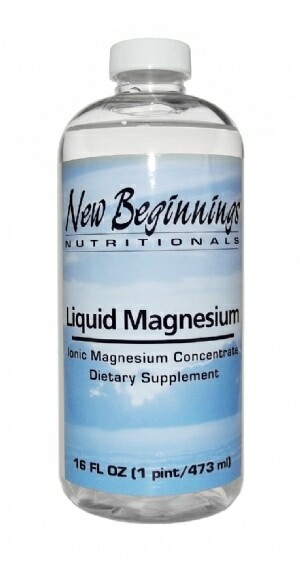 New Beginnings Nutritionals Liquid Magnesium is an ultra concentrated blend of bio-available liquid ionic magnesium that mixes easily into water or juice. Ionized minerals are very bio-available because they are easily recognized and absorbed by the body, which results in better utilization and assimilation into the cells. This unique ultra concentrate ionic formula was specially created to provide the highest amount of absorbable Magnesium in the smallest amount of liquid possible for ease of administration. Magnesium is an essential mineral that is important for adequate calcium absorption, cellular metabolism and overall healthy body functioning. Magnesium deficiency can include poor appetite, anxiety, mental confusion, weakness, fatigue, confusion, sleep disturbances, and muscles spasms and twitching. 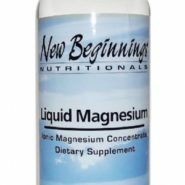 New Beginnings Nutritionals Liquid Magnesium contains water-soluble Magnesium in an angstrom-sized (1/10,000th of a micron) ionic form bonded to ultra pure water that can be easily absorbed into the cells with no digestion required. This formula is free of artificial preservatives or sweeteners and is likely to be tolerated by even the most extremely chemically sensitive individuals. 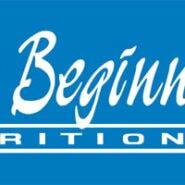 Suggested juices that work best with New Beginnings Liquid Magnesium include pear, pineapple, grape or orange. It is advisable to begin dosing magnesium with less than a full dose and work up to a full dose over the period of one week. If loose stools and/or diarrhea appear, reduce the dosage until bowel movements normalize. Other Ingredients: Ultra pure water and potassium sorbate (to naturally preserve freshness).